You must make reservations at least 5 minutes in advance of the time at Revolution at Beaver Creek Lodge. Please enjoy the use of our complimentary valet parking. You only need to bring your valet ticket with you when you dine and one of the Beaver Creek Lodge's front desk staff will be happy to validate your parking. Adjacent to Beaver Creek Bus/Transit stop where you are dropped off/picked up to go to the parking lots, in the Beaver Creek Lodge. Revolution can accommodate a small intimate gathering or your 100 person wedding with style. We offer creative food selections made with the highest quality ingredients. Revolution is a cutting edge restaurant where all meats are cooked in a rotisserie fashion. Each table will have a rotating platter in the center where the worldly sauces and flatbreads will be spun between friends and family to share. An eclectic list of craft beers, worldly wines and small batch cocktails will be available to enjoy in our indoor-outdoor patio in the summer or around the fire pits in the winter. Revolution- where life revolves around great food. Eating at Revolution was a last minute decision. Even though they specialize in steak, when we got there and looked at the menu we both couldn't ignore the amazing sounding gourmet burger - just what we were in the mood for. A good burger is hard to find and at $30 that included 7x ranch waygu beef, foie gras and porchetta we were anticipating one of our top burger experiences in recent memory. However, what we received was a complete disappointment at any price. The burger was wafer thin, overcooked and dry (it was so thin there was no way you could have cooked it with any pink in the middle). You couldn't taste the foie gras or porchetta at all. I did find the foie gras and tasted it by itself and it was bland and grainy. The burger was topped with 2 small leaves of iceburg lettuce that didn't even cover the patty and two old looking slivers of tomato. It wasn't awful but it both looked and tasted well below even just an average burger anywhere else. I'm not a fan of McDonalds or Burger King but they both have this burger beat hands down (at 1/10th the price no less). I'm really not sure why they have this on the menu. Maybe it's what we get for ordering a burger at a steak restaurant but for that price they should at least fake a reasonable attempt. They clearly didn't make much of an effort with it or have their heart in it. Not that it matters since we were anticipating the burger to be the star of the show but we also ordered a side of the Brobrucau as according to our waitress, it's one of their specialties. We new it was brussel sprouts, but it turns out they are shredded and then deep fried. Unfortunately being so thin, this makes them extremely oily. Although the first bite was good, that's about all we could take before the oil was too much - we were not a fan. I couldn't recommend Revolution - but maybe they're better at steaks. However, we won't be giving them a try after spending over $80 on two lame burgers and a greasy side dish. It was expensive cocktails and low quality food with little atmosphere. Really didn’t like the place. Great food. Ate there several times and tried a bunch of stuff. Everything was really good. There was always a crowd and it was a fun and lively place with a great view of the slopes. I visited Revolution right after they opened and it was AMAZING! We don't get to eat at such expensive restaurants often, and were so excited to bring our out of town friends. The food was NOT GOOD! The service was average. Our bill for 4 people was over $400!! I could have gone to Outback Steakhouse and had a better meal. I am hoping it was just a bad night for them, but I am really sad to have spent so much money and wasted a special evening on such a bad dinner. After reading all the reviews about this steakhouse, we made an reservation for dinner and my husband and I was looking forward to have a relaxing good meal. Revolution did not disappoint! This rotisserie/steakhouse boasts a mountain-chic setting, comfortable seating and the servers are very friendly. Instead of bread and butter like most places, they give you a basket of naan/tortilla with 6 different dipping sauces to start. 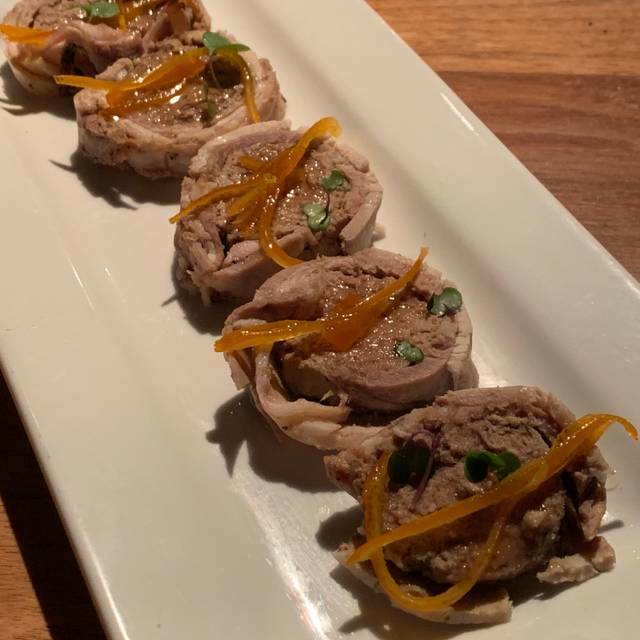 For appetizer, we had the Chicken Liver Pate wrapped in Pancetta which was pretty good. 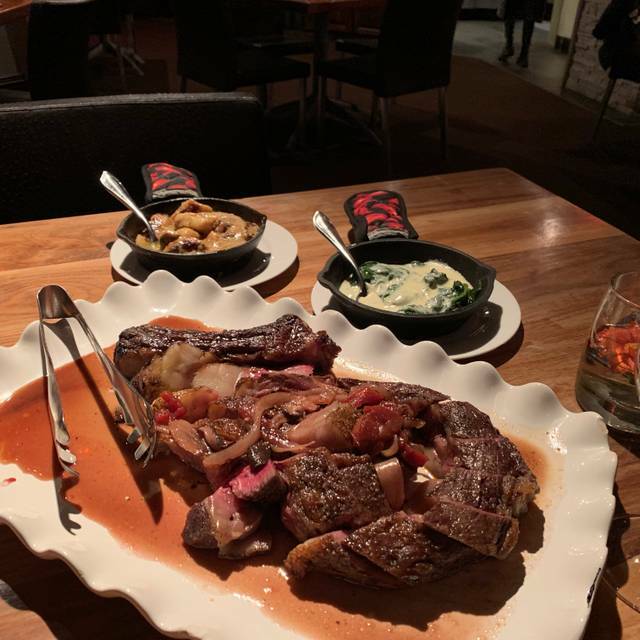 We ordered the 40 oz Wagyu Ribeye steak to share, it was tasty, cooked just the way we want it and quite juicy. Please note that all meats are cooked in a rotisserie fashion. The only thing is the cut was a bit too fat, I’d say about 10oz of fat. We enjoyed our meal along with a bottle of wine. It was a very pleasant and unique experience. Oh, did I mention the service was great? We have been to this restaurant several times in the past but this time the menu had changed and was very small. It was not what we were expecting. They used to bring out tortillas and flat breads with some really great dipping sauces and now the dipping sauces are a few salad dressings, that was disappointing. We probably would not go back because the menu is too small and there are many other better choices in Beaver Creek. Salmon portion was small and came out cold. Food prices were overpriced even for Beavercreek. For the price, I would have expected better ambiance and better cooked food. On a positive note, the servers were very attentive. It was one of best restaurant experiences that we’ve ever had. My son said it was his favorite restaurant of all time. The steak was amazing and our server Bruno was fantastic. Definitely will go back. Food was quite mediocre and not worth the price. We found the menu to be creative with some different main entree types than most restaurants. Comfortable atmosphere, you could have a conversation easily due to low noise level. Service was very attentive. We were very pleased with finding Revolution. We were very disappointed in our experience on Sunday evening. We discovered the restaurant a few years ago when they had newly opened. We met the owners and they were lovely. At the time the service was extraordinary and the food was great. Each year we have an annual trip as a family to Beavercreek and look forward to our dining experience at Revolution. Sunday, the service was very inferior. Very little attention.Their signature nan bread in a hand carved bowl was nonexistent and our family of five was served with 4 tortillas instead in a basket, Dumped on our table with no explanation of the dipping sauces. We expressed our disappointment to experience only marginal improvement. We will not be back. We booked for a party of 8 and arrived on time at 7 p.m. We are promptly seated and greeted by our waitress. We ordered 2 bottles of wine and waited for 45 minutes before the wine arrived at our table. Apparently they could not locate the wine in their cellar. Took another 5 minutes for them to get wine in our glasses because they could not find a wine opener. We ordered our meal at 7:20, by 8:30 no food. We asked for manager twice, no one came to our table. We got up and left at 8:45 without eating and we went to another restaurant. Don't go here! $95 filet mignon never arrived, so we don't know if the food is good, but the service stinks!!!! Excellent food and location. Right in the village. Lamb is exceptional. Avoid at all cost. We waited an hour and a half to get our food, then were told that they no longer had one of our dishes, what else would we like. The ‘beef tartare’ was cooked and served cold with 4 slices of cold toast. Never in the entire world is beef tartare cooked! Looked and tasted like an old cold hamburger patty. We later talked to a local who confirmed that it is a terrible restaurant and not sure why it is still open. Food was fantastic - fresh, local ... well prepared, well served. Walked out. Reservation at 6:45. Seated and had to flag down a server 15 minutes later to get water for us. Water arrived and waiter turned to table that was sat after us to take their order. Most ridiculous lack of service. When we complained on the way out the bartender argued with us and then told us to sit at the bar. I had a table reservation. Why would I sit at the bar? The worst service I have received at Beaver Creek. Won’t be back and won’t recommend. Couldn’t pay me to to eat there. We had a reservation@Revolution for NYE. The menu was limited, which was fine if they had not run out of multiple things. Service painfully slow...took 2 1/2 hours to get the food. It is a small restaurant & obviously under staffed. 1) to keep it short! over priced wines yet no sommelier. We found ourselves with empty glasses for long periods of time yet the waiter would not come to serve. Then, to our surprise, another employee came to serve with no knowledge of wine whatsoever. I think the least this restaurant should do for the kind of place they want to be is to have an experienced sommelier. 3) the meat was good but not worth $85/piece. For that amount or less I can eat much better at Mortons, Ruth Chris, etc. Went to Revolution for my birthday. Food was extraordinary. Service was terrible. Waited 20 minutes after being seated for our server to acknowledge us. We both loved what we ordered..shrimp salad, wedge salad...no time for entree as we were headed to a concert. There was too much time in between table checks and we ran out of time. No mention of my birthday we were celebrating. Seems like the chef has it together but the front of the house was terrible. Somebody needs to get the two in sync and this place will be great. Until then, we won’t return as it’s too expensive not to have the full house together. A good meal, great wine list, unique complimentary bread with toppings. They can speed things up because menu has a good variety & food was good. I would definitely dine there again as it was casual with more upscale food. Absolutely awful experience. We were a table of 10. We had a reservation for months and confirmed beforehand so we didn’t surprise them. We waited at our table for 30 minutes before seeing a server and getting bread. He disappeared again for a very long time and didn’t take our order so I asked for another bowl of naan and the server gave me somewhat of an attitude about it. During this time we thankfully flagged down the sommelier for a bottle of wine bc we would never have gotten that! Again we were left for a long period of time. After ordering we waited an absolutely unacceptable amount of time for our food. Our table only ordered 4 appetizers (2 nachos and 2 salads) and then the wait proceeded again. 3 people ordered salad as entrees so the dinner had no excuse for taking so long as many tables came and went during our seating. The worst of it all was for those that ordered a steak and twice baked potatoes....It was a tiny steak on a plate with one teeny tiny half a potato. I can’t understand how they didn’t offer a whole potato or one large half. Ridiculous. We left annoyed and starving. I always came to Revolution (as well as Hooked) but not again. The food was not very good. The waitress was in the weeds. The room was strange. Fail. Good food, fantastic service , on time meal. Great food and great service. Happy hour was amazing. Great place, Sarah was our server and really did a great job. 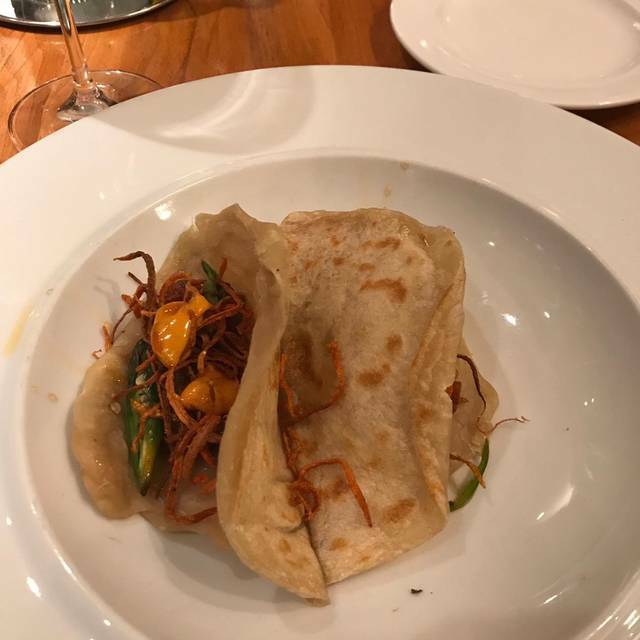 The banh mi taco special was the highlight of the meal, and there are some good reasonably priced bottles of wine (we had Turley Zinfandel, very nice and priced at $80. Our dinner was just ok for the price. We were told that the restaurant was out of salmon because a delivery wasn’t made but our friends ordered salmon at a seating 90 minutes later. We were also charged $1 for each nan serving but wasn’t told this prior- not a big deal but kinda “nickel & dimeing”. The service was good but I was expecting better food. We dined here during a visit to Beaver Creek. The food was good but the service was exceptional. The food and service was excellent. I was initially concerned because the ratings were good but not great. The experience exceeded expectations. We went here during the off season (September) and we were the only people in the restaurant so it was very nice. The service was great and the food was very good. Only issue was the valet didn’t get that we were only there for dinner and not to stay. We have been there about 5x and have never been disappointed. Shave your receipt and get a free ice cream cone 2 store fronts down after your meal. One of a kind restaurant - best salmon and steaks!!! Homemade tortillas as you sit down and fabulous wine and cocktails. $16 for makers mark is pretty silly. Otherwise pretty good. The food was amazing! We have been to a lot of restaurants in Vail/Beaver Creek this week and this was the best food!!! I am not a complainer, and I don’t mind spending money for a good meal.... This restaurant is fraudulently proporting to be serving Kobe beef.... What they served my family was equal to Outback Steakhouse in quality at three times the cost. We dined at five Restaurants in Beaver Creek.... Revolution was the worst by far. Great for well heeled valley tourists if you don’t mind over priced, unimaginative food. Great for Happy hour; dining not so much.